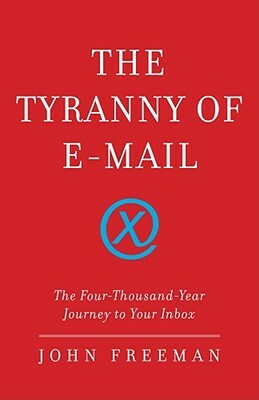 The award-winning president of the National Book Critics Circle examines the astonishing growth of email—and how it is changing our lives, not always for the better. John Freeman is one of America’s pre-eminent literary critics; now in this, his first book, he presents an elegant and erudite investigation into a technology that has revolutionized the way we work, communicate, and even think. There’s no question that email is an explosive phenomenon. The first email, developed for military use, was sent less than forty years ago; by 2011, there will be 3.2 billion users. The average corporate employee now receives upwards of 130 emails per day; by 2009 that number is expected to reach nearly 200. And the flood of messages is ceaseless: for increasing numbers of people, email means work now occupies home time as well as office hours. Drawing extensively on the research of linguists, behavioral scientists, cultural critics, and philosophers, Freeman examines the way email is taking a mounting toll on a variety of behavior, reducing time for leisure and contemplation, despoiling subtlety and expression in language, and separating us from each other in the unending and lonely battle with the overfull inbox. He enters a plea for communication which is slower, more nuanced, and, above all, more sociable. JOHN FREEMAN is an award-winning writer and book critic who has written for numerous publications, including The New York Times Book Review, the Los Angeles Times, The Guardian, and The Wall Street Journal. Freeman won the 2007 James Patterson PageTurner Award. He is the editor-in-chief of Granta and lives in New York City.